We're not just all about pizza! 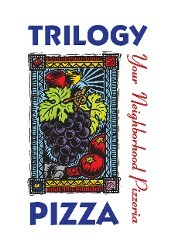 Trilogy Pizza also offers crisp, fresh salads and mouthwatering pasta. We have been serving San Antonio for years, and we can't wait to serve you. Organic baby spinach, balsamic vinaigrette, walnuts, cranberries, red onions, bacon, tomatoes, and fresh mozzarella. Fresh greens, sweet dried cranberries, walnuts, feta cheese, and balsamic vinaigrette. Fresh greens, tomatoes, mushrooms, black olives, onions, and croutons. Fresh romaine, Caesar dressing, topped with croutons and parmesan cheese. A fresh, creamy garlic Alfredo sauce topped with parmesan and Italian seasonings. Chicken may be added. Marinara with ground beef and Italian sausage, topped with grated parmesan and Italian seasonings. This pasta features olive oil, tomatoes, garlic, fresh basil, and parmesan cheese. Chicken may be added.